The new parallel forms option is most useful for the databases in the center and right panels on the main Select page. This includes Math Standards, ACT/SAT prep, AP subjects, and Pre-Alg to Pre-Calc. What’s special about them? The questions, almost 80,000, are written by EducAide (not republished), and they’re intentionally paired. If you skim through the databases, you’ll see, almost always, that two in a row cover the same skills and are similar in appearance and level of difficulty. 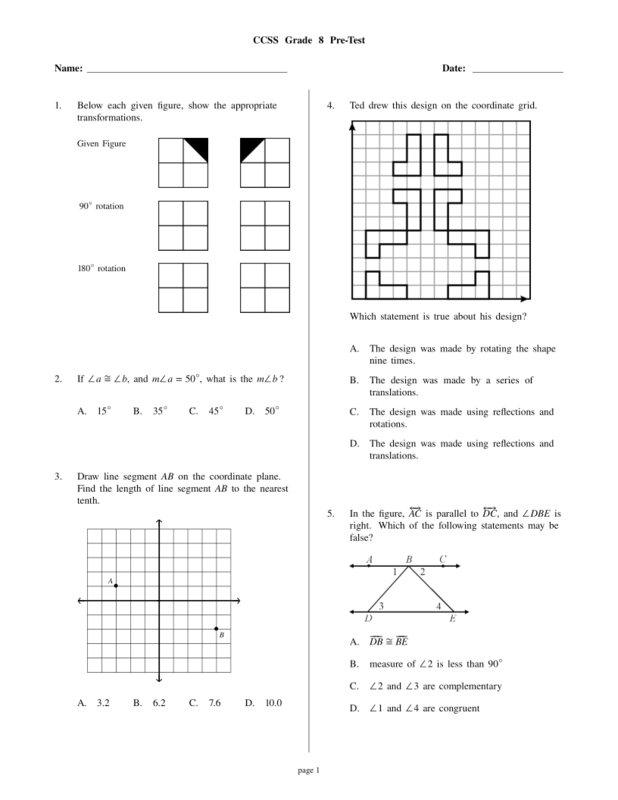 Sample parallel forms for CCSS math, SAT and ACT. The best way to understand parallel forms is to try it with some paired questions. It’s fast and easy! 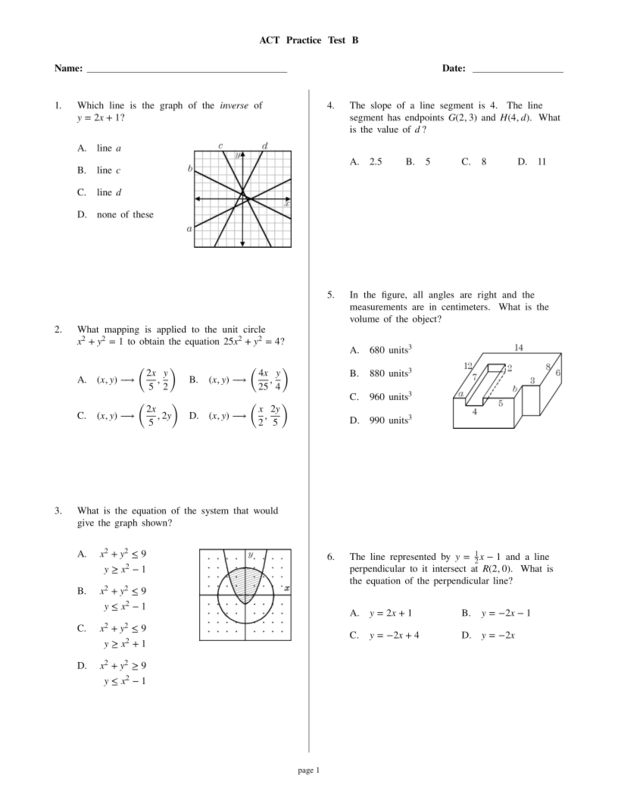 Below is a very quick tutorial using the Common Core math database. There’s a related option called “Language Switching”. It helps you create matching forms in English and Spanish for math grades 1–5. More information is here. Parallel forms is a subscription option. To learn more about what’s included in a school-wide subscription, click here. Log in to Problem-Attic and start a new document. Give it a name like “Test Form A”. 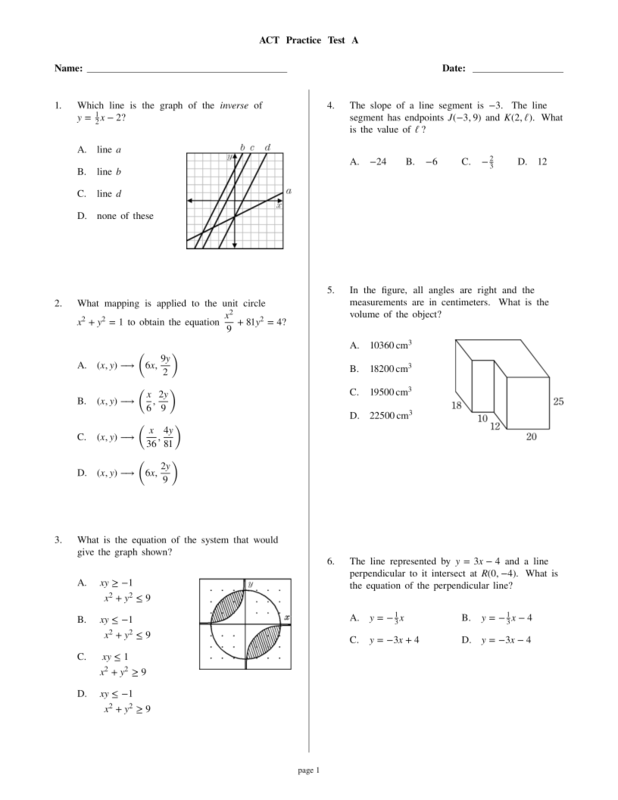 On the main Select page, click the link to the Common Core math database. You can, of course, select questions one at a time. But for this tutorial, you should try selecting a certain number at random. For example, click the tab for middle school, then click Grade 8. 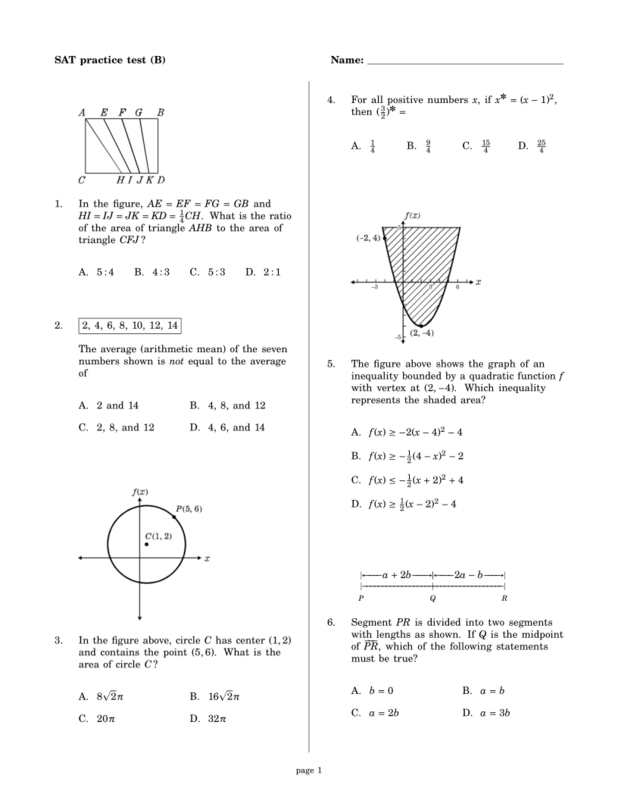 Now right-click on Geometry and choose Add Problems, as shown below. In the Add Problems dialog, type a number like 20, then click the Add button. In case you didn’t know, the right-click option works at any level. 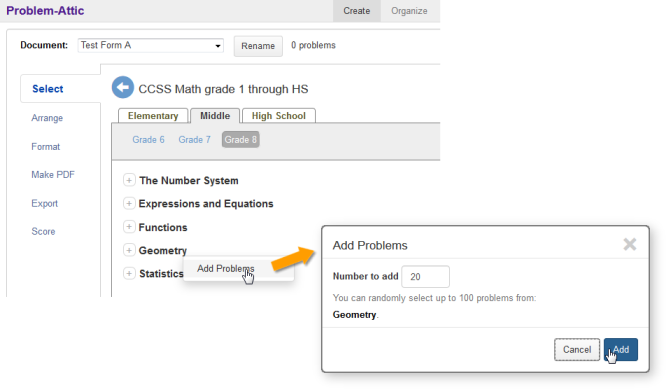 It could be used to select questions from all of Grade 8, or from any category or subcategory below Geometry. Make any changes you like on the Arrange and Format tabs. You can move problems around or delete those you don’t want. Click the Make PDF tab, then download your document. Click the New button near the top-right of the page. In the New dialog, type a name like “Test Form B”. You will see the question, What would you like to start with? Choose “Copy of”. Next to the option should be the title of the document you just worked on (Test Form A). If not, browse for it. Now you will see Options for parallel forms. Choose “Switch problems (make use of odd/even pairs)”. Then click Create. Click Make PDF and download your document. That’s it! 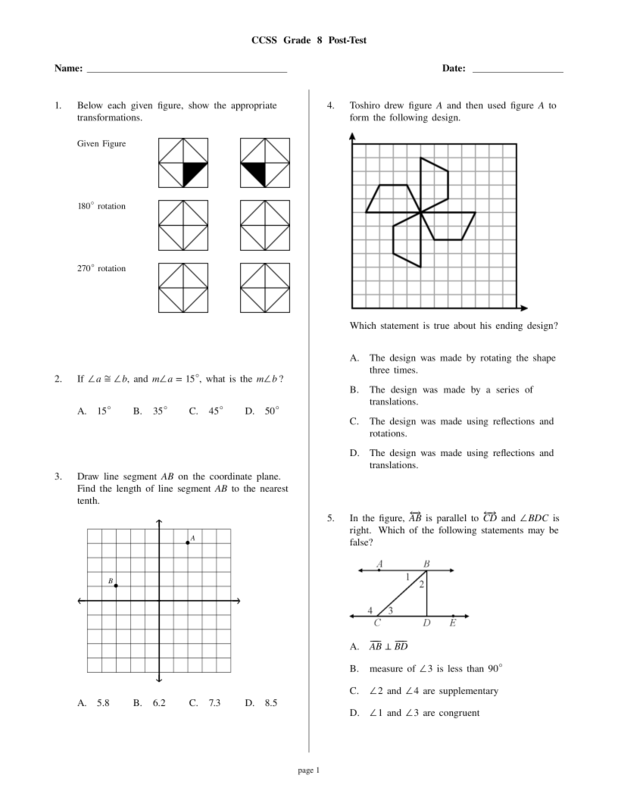 You should have two documents with closely matched questions, like those shown above. We’ve tried to create odd/even pairs for all original questions in Problem-Attic. However, it’s easier to do that with math, where such questions are often called “clones”, than with other subjects. 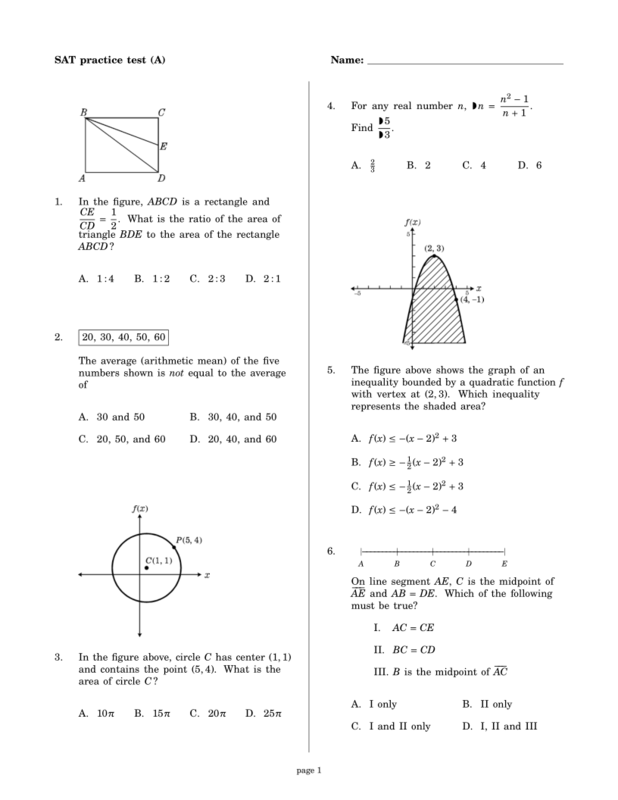 In the original math databases, essentially all multiple-choice questions are paired. For open-ended questions and tasks, and for non-math databases like AP Chemistry, we’ve tried to put two similar questions next to each other, but you can’t rely on them covering exactly the same skills or being the same level of difficulty. You should definitely review all non-multiple choice questions when creating parallel forms and, when necessary, edit them or manually substitute other questions. When creating parallel forms, there are two special cases that you should be aware of. The first is when you select both of the paired questions. In that case, on the parallel form, they will simply be reversed: the even will take the place of the odd, and vice-versa. The second special case applies to a very small number of categories, mainly in Math Standards and AP subjects, where the total number of questions is odd—the last one in the category is not paired. If you happen to choose that last question, it will be unchanged in a parallel form. 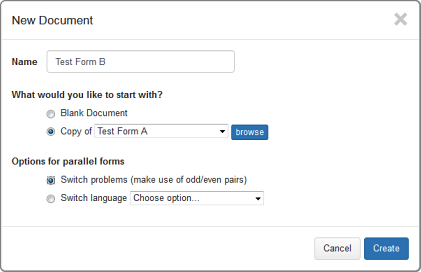 The parallel forms option will work with any document that you create in Problem-Attic, and it’s possibly useful with questions that are re-published and not specifically paired. For example, if you use the option with questions from NY Regents or State Assessments, and they come from a topic that is narrowly defined, then you might get forms which are relatively close—or close enough for a review worksheet and final exam, or a make-up test. However, since the questions are not written as odd/even pairs, it’s likely you’ll get varying levels of difficulty, a mix of skills, and not something that you could properly call Test Forms A and B. The parallel forms option does not work with questions that you edit, because Problem-Attic does not keep track of their origin. In effect, an edited question is treated as brand-new. Of course, you can manually swap out an edited question. Another option is to create parallel forms first, before making any changes to questions.